The Beehive is Sligo’s newest hostel, located a 1 minute walk from the train and bus stations. Newly renovated, light filled, brilliantly located, clean & comfortable with maximum security with coded front door. We are located in the centre of Sligo town, a 1 minute walk from the bus and train station, as you leave the stations look directly in front of you and you will see our sign. We are walking distance from all the tradional pubs and all of Sligo Towns attractions and a short car/bus journey from the most beautiful beaches Sligo has to offer. 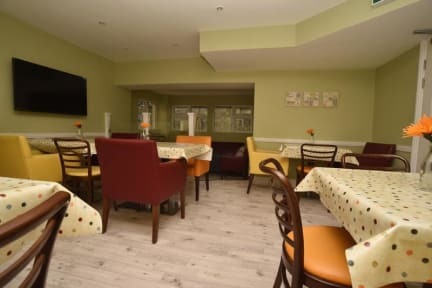 At The Beehive you will get comfy brand new mattresses, spacious stylish rooms, free light breakfast, communal Kitchen, lounge Area, lockers in all rooms. All dorms are en suite. Free high speed Wi-Fi in all rooms & so much more. Payment upon arrival by cash, credit cards, debit cards. This property may pre-authorise your card before arrival. Full payment is required on arrival. Must have a valid photo ID in order to check in. Reception hours are 9 am to 10pm. Groups Will be asked for Security Deposits. I booked for a night, nice hostel in a nice town, cleaned and with a cool atmosphere.. I would definitely recommend this place. Ostello consigliatissimo!! Davvero pulito e molto vicino alla stazione degli autobus, ideale per chi vuole andare a fare escursioni in giornata. ostello confortevole e ottimo rapporto qualità prezzo.personale giovane e disponibile.la posizione è comoda perchè si trova ad una cinquantina di metri dalla stazione degli autobus.se non si hanno pretese particolari e si vuole fare una vacanza tipo" ZAINO IN SPALLA" direi che è un ottimo appoggio.